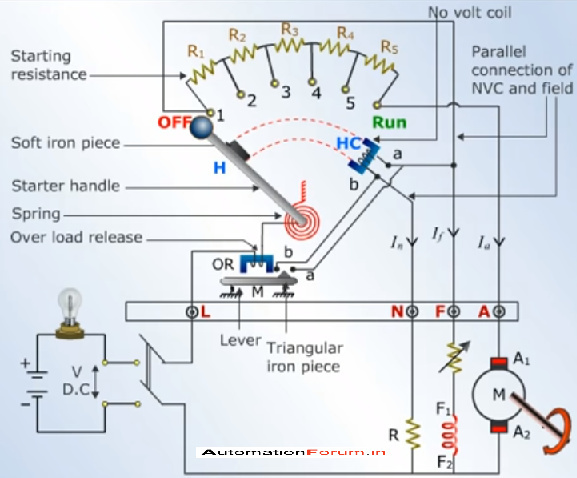 During the starting of the motor, the armature current will be high and it may damage the fuses, armature winding or commutator brush arrangement. There will be an increase in torque during the starting. Due to this increase in torque, there will be a high centrifugal force and it could throw off the armature winding. And thus to avoid all these problems starters are used for the starting of the Dc machines. While adding a starter the main difference between normal starting mode is adding an external resistance to the armature winding at the starting. 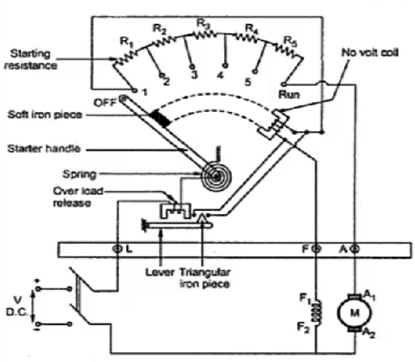 Electromagnets hold the liver and if there is no supply then it will release the lever if the motor is overloaded beyond a certain value the electromagnet D will be activated and it short circuits the E electromagnet and then the lever will be released thus the motor turns off. 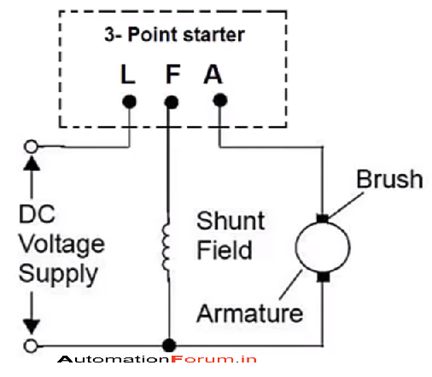 The major difference between 3 & 4 point starter is there is no voltage coil connected in series with field coil field will be directly connected to the supply as the lever comes in contact with the arc the voltage coil is connected with the current limiting resistance and this guarantees that a change of current in the shunt won’t affect the current to the coil which means that the spring doesn’t need to restore the lever position the electromagnet is sufficient.